Markets Set New All Time Highs Again Today - Dow Up More than 7,200 Points Since 2016 Election - Nearly Every Third Day a New All Time High! 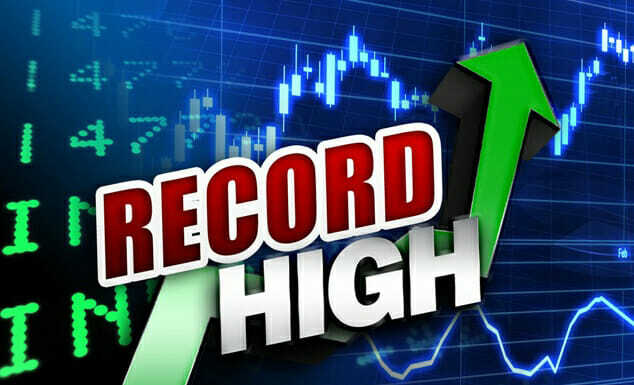 Markets Set New All Time Highs Again Today – Dow Up More than 7,200 Points Since 2016 Election – Nearly Every Third Day a New All Time High! The Markets were up again today continuing the greatest welcoming to the New Year that the Dow has ever had! Since the 2016 election the Dow is up more than 7,200 points or 39% with nearly every third day a new all time high. We reported over the weekend that last week’s rally was the greatest first week of a new year in the more than 100 years of the Dow reporting. The Dow was up 576 points for the week. This is the most the Dow has ever gained in its first week of any year since the early 1900’s when the Dow first started being calculated… and the Dow just keeps on rising. In 2018 already the stock market has reached five new all time highs in its seven days of trading closing today at 25,574. * The Dow has increased more than 7,000 points since the November 8th 2016 election when the Dow closed at 18,333. This is the largest point increase in this amount of time in Dow history. This has never happened in the more than 100 years in the Dow. * The Dow increased more in 2017 than any year ever in Dow history! The Dow ended 2016 at 19,763 and increased nearly 5,000 points in 2017. This is the most ever by more than 40% over the next best year ever! 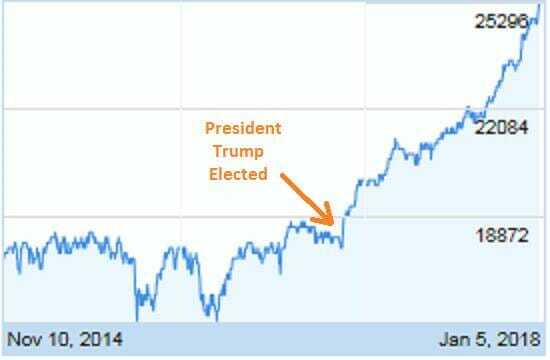 (In 2013 the Dow was up 3,472 points. * Since the election the Dow surpassed 7 major milestones – 19,000, 20,000, 21,000, 22,000, 23,000, 24,000 and 25,000. * President Trump’s stock market rally is historical! No President saw more all time highs (71) in their first year in office than President Trump. No President has seen more all-time highs in a year ever. * Nearly every third day is a new stock market high (32%) since the 2016 election. Some media discount the Trump stock market and suggest that it is an extension of Obama’s market, but this is clearly not true by just looking at the Dow results from late 2014 through last Friday alone. The Dow went down in 2015. Let’s give President Trump his due. The Stock Market Rally is historical! Winning! Winning! Winning!